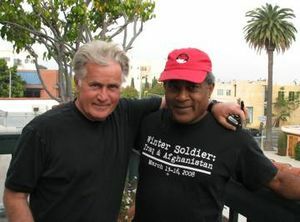 11 "Free the Cuban 5"
Martin Sheen is a well known actor and activist. On January 21, 1992 Steve Tarzynski, National Political Committee of Democratic Socialists of America, wrote a letter to "Harold" (probably Harold Meyerson). "Following is the list of possible major donors I can think of to pledge support for Trish and our program in southern California. Additions and comments sorely needed." Question marks in original list. We know you have been generous in supporting DSA's important work in the past. We'd like to develop a core of at least twelve people who will pledge 1,000 annually to keep our Organization working for Southern California DSA. We invite you to be one of those people. This select group of members and friends would have a key role in rebuilding a democratic left opposition in California. This unique group of individuals would form the "Upton Sinclair Club" which will act in an advisory role meeting with the Southern California DSA leadership at an annual brunch. Sinclair Club members will receive a quarterly bulletin reporting on Southern California DSA's progress, and will have an opportunity to meet international DSA spokespeople and international guest speakers in more intimate small group settings. Admission to all local, statewide, and national DSA events in the Southern California would be complimentary with membership in the Sinclair Club. The draft was accompanied by a "List of Potential major donors to DSA"
In 1994 Martin Sheen was an initiator of the International Peace for Cuba Appeal, an affiliate of the Workers World Party dominated International Action Center. Martin Sheen, signed the letter, from the Colombia Support Network . The December 1st 2007 —ACLU Dinner on Saturday, December 1st at the Dearborn Hyatt Regency Hotel,Michigan, featured actor and activist Martin Sheen. From an April 8,2011 letter. We, Actors and Artists United for the Freedom of the Cuban 5, want to extend our deepest gratitude for your recent visit to Cuba, as well as our support for your statements promoting improved relations between our countries. Further, we enthusiastically support you in having subsequent discussions with President Obama and Secretary of State Hillary Clinton and hope you will call for urgent action on their part to make right this unjust situation. Again, we thank you and look forward to the possibility of improved relations and future visits to Cuba. Martin Sheen, Cardinal Peter Turkson of Ghana, and Emira Woods were all invited guest speakers at the Africa Faith and Justice Network's 30th Anniversary, March 1, 2013 through March 3, 2013, University of Notre Dame. South Bend, IN, USA. Endorsers of the proposal included Martin Sheen. This page was last modified on 7 July 2017, at 18:45.